Browsing antiques shops in Wiltshire, Alison Bannister stumbles across a delicate old portrait—supposedly of Anne Boleyn. Except Alison knows better. The subject is Mary Seymour, the daughter of Katherine Parr, who was taken to Wolf Hall in 1557 as an unwanted orphan and presumed dead after going missing as a child. And Alison knows this because she, too, was in Wolf Hall, with Mary, in 1557. The painting of Mary is more than just a beautiful object for Alison—it holds the key to her past life, the unlocking of the mystery surrounding Mary’s disappearance and how Alison can get back to her own time. But Alison’s quest soon takes a dark and foreboding turn, as a meeting place called the Phantom Tree harbors secrets in its shadows. Immersive is the word I’d pick to describe my reading experience of The Phantom Tree by Nicola Cornick. The story is an entertaining blend of history, mystery and romance with a slight fantasy element. Narrated in dual timelines of present day and mid-sixteenth century, and set in London and Wiltshire, this complex, multilayered tale is full of drama and deceit with bits and pieces of Tudor history. One evening in present day Wiltshire, Allison Bannister comes across a dated Tudor portrait in an antique shop, the subject presumably being Anne Boleyn. Allison, however knows for a fact that the woman in the portrait is Mary Seymor. Historically speaking, there is no record of Mary as an adult. Born in 1548 to Thomas Seymour, Baron of Sudeley, and Katherine Parr, widow of Henry VIII of England, Mary Seymor mysteriously vanished from history when she was a child. So, why and how does Allison believe the woman to be someone who technically disappeared in history? Allison knows this for a fact, because back in 1557, when nine year old Mary came over to live in Wolf Hall following the unfortunate death of her parents, Allison was there, eleven years old, residing in Wolf Hall, and about to share her chamber with Mary. Beautiful, wild and free spirited Allison never got along with plain, quiet and meek Mary, their relationship being prickly at best and downright hostile at worst. A few years later, a fateful turn of events force them both to help each other and Mary promises Alison to help her look for something she’s been desperately searching for. How does Allison end up in the present day and did she find what she was looking for? What was she looking for? Was Mary able to keep her promise through the centuries? What really happened to Mary and how did she get lost in history? The answer to these innumerable and inexplicable questions is what makes up this extremely engaging story. Of course, there are a few magic elements but they’re beautifully incorporated into the mystery. There is also some romance in both the timelines and just the right amount. The story concludes with a completely unexpected but totally satisfying twist towards the end. 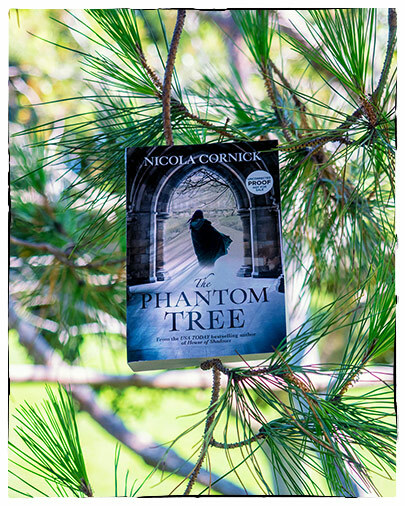 The Phantom Tree is an absorbing dual timeline historical mystery that beautifully combines fact with fiction and tells an unforgettable tale of love, loss and redemption. After reading this, one might just believe magic is real and time travel a possibility, that promises can be kept over centuries and sometimes what we seek isn’t necessarily what we need. All in all a relishing read! Disclaimer: An ARC was provided by Harlequin Books and TLC Book Tours in exchange for an honest review. All opinions are my own. Thanks for the good conclusion in the last paragraph. You make me intend to read it!